We’re in the middle of the KJazz pledge drive so very little tatting time. Mostly working on the gloves and have just finished them up, but haven’t taken a picture yet. Will try to do that before I wrap them up and send them out to the buyer in the UK tomorrow. Not much else going on. 13 hour days at work and class at night, so not much time for tatting, unfortunately. Things will all settle down next week and get a little bit back to normal. No, I’m Not Sunburned, That’s just Bad Lighting. I took this picture last night after I finished the first of the two gloves for an Etsy order. I was going to try to get another picture taken today in natural light, but our pledge drive starts on Saturday so it’s been crazy at work and I didn’t get around to it. It’s hard to tell in this picture, but the rings are in ecru and the chains in natural. This is a custom recquest for colors. I really like how it’s coming out. If I have a chance to get someone to model and take some pictures of them before I send them out I think I’ll list them in the shop as a nice wedding alternative to the snow white ones I have up now. 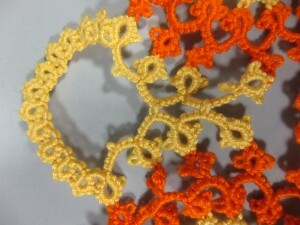 The pattern is available here and also as part of my book of patterns based on a single motif. I haven’t gotten around to hiding in any more of the ends from the new start of the tea cloth. The next couple days I’ll be focused on getting the second glove done and getting work finished for the KJazz pledge drive. Busy, busy, busy! Well, I’ve made some good progress on the first “real” version of the tea cloth, but most of it was done in the car or on an airplane with just a bit too much movement for trying to sew in ends. I’ve got a total of 1 done so far…. I’m making this out of size 50 Flora that I’ve had for a while and I’m pretty happy with the way it’s turning out. I did hide that one end because I haven’t actually done much sewing in of ends with the smaller sizes and I wanted to make sure it wasn’t going to be too bad. I still haven’t found a good needle for sewing in size 80. The finished piece always ends up looking bulky to me, but the 50 seems to be working nicely. Just need to sit down and do them. This tea cloth is made up of so many little motifs that I expect the hiding of ends will be the most annoying part of the project, but if I keep on top of them and hide them as I go they shouldn’t be too bad. I’m color coding this piece as I go. Here you can see the start of it as all the 16-ring circles are in white and the 12 ring circles in light purple. Then I have the other parts mapped out as medium purple, dark purple and black. Hopefully the whole thing looks good when it’s all put together. I’ve just started a pair for fingerless gloves for Etsy order so that’s going to keep me busy for the next few days. Afraid that means there’s not much to report here but a bit more progress on the half-circles in the tea cloth. If I get the gloves finished up I’ll probably finish off the half-circles this weekend. For the most part though I’ll be busy on the fingerless gloves so don’t expect much for the Priscilla books. I’ll take a picture of the gloves when I’m done. They were requested in a color combination that I haven’t done yet so I’m curious to know how they turn out. So far, they’re looking good. This week I’m getting started on the next part of the tea cloth from Priscilla #2. This section: Half-circles. These half circles are the space fillers between the larger motifs of round 4. Surprisingly, I didn’t have to make many changes to the pattern as written. The only difference was that the original pattern called for 4 stitches between the rings of the half circle part and I did 2. Could be this is because of the changes I made in earlier rows. 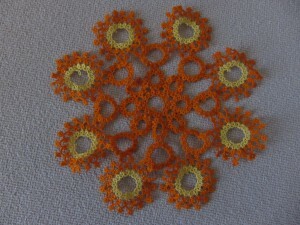 Could be just another effect of the smaller joining picots of modern tatting, but it was an easy change and seems to have worked. 7 more of these and then I’ll tackle the oblong motifs that surrond this center part of the tea cloth. I suspect there will be lots of changes involved in these motifs, mostly because the directions are so vague and incomplete. Also, it calls for ridiculously long chains between the rings and I just can’t see how that’s going to work. I’ve started on the next “real” version of the tea cloth, but haven’t really made enough progress for a picture. Maybe I’ll have something more substantial in the next couple days. Here’s one more picture of the half circle that better shows their placiment in the piece. After yesterday’s post about how I’m not very sad about the tip breaking off my nicest shuttle I read today that Gina Brummet of Threads of a Tatting Goddess passed away yesterday evening. 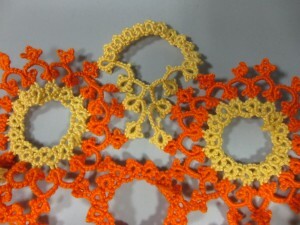 I knew Gina only through the 25-motif challege and her blog, but was especially touched by her project of working through the DMC Tatting by Therese Dillmont. Everytime I read about how she had adapted and modernized a new motif from the books I was amazed her ability to so clearly translate the pattern and turn it into something that looked so completely modern. 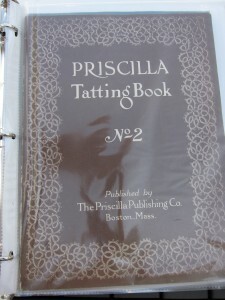 It was a ready inspiration to my own project with the Priscilla books and made me realize the possibilities that can be found in these older tatting books and the possibilities that become available when they are updated. Every time I read one of her posts it made me want to pick up the shuttles and thread. I’ve made a donation to the Antique Pattern Library in her memory as it seemed like the most apporiate way to honorher. I have sad news to report. 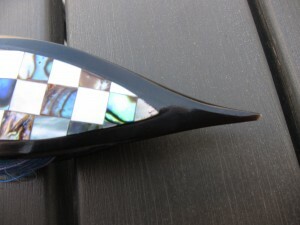 I dropped and broke the tip off my gorgeous bufflo horn with checker board mother-of-pearl and paua shell shuttle. I guess I should have known better than to actually use this shuttle for tatting, but I thought if I were careful I could do it. I always keep the shuttle in the case it came in and only take it out when I’m actually tatting with it. It has always been reserved for projects with King Tut quilting thread since they require a nice sharp point and I geneally only pull out the King Tut when I’m in a nice clean space with good lighting and not too many distractions (i.e. not traveling). But none of that helped today when I dropped the shuttle on a hardwood floor. It’s sad to see such a gorgeous piece of artwork broken, but it is only a thing so while I’m disappointed, I suppose I knew I was going to break it eventually, so I’m not actually broken hearted about it. I guess I knew from the beginning that I could either put it safely away and not use it or use and enjoy it (it’s really a pleasure to tat with) and have it eventually get broken. Now that it’s finally happened I can sort of breath a sigh of relief and stop worrying about breaking it. In fact, now I get to use this shuttle for every day which is actually kind of exciting. It got me thinking again about a couple months ago when Pat Stevens showed Sarah and me her fantastic shuttle collection. It’s an amazing collection with I don’t know how many hundreds of shuttles that span the entire history of tatting. It was fun to talk to her about it, but honestly, I can’t see myself ever really collecting shuttles. At least not just for their own sake. 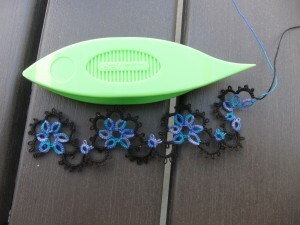 To me the shuttle is a tool and if it can’t be used for actual tatting I loose interest. Sure. I have lots of different shuttles, but in a way, the astetics of the shuttle are second to the usefulness. I’m actually starting to look into the idea of making my own wooden shuttles (don’t hold your breath, folks. I know nothing about woodworking so it’s a long way off) not because I’m excited about making the shuttles, but because I’m excited about tatting with a shuttle that’s EXACTLY what I want in a shuttle. It’s funny to be writing all this about not being interested in shuttle collection because in the last month or so I’ve gotten started a bit of an antique book collection going. It started off with some searching on eBay for original copies of the Priscilla books so that when I write up my updated versions of the patterns I can include pictures from the originals. I went a little overboard and started picking up a lot of other antique books. I can definitely see myself going into the history of the books in the same way that Pat has gone into the history of the shuttles. Maybe I’ll go through the books here on the blog one day, but for now I just want to announce my happiness in finding copies of BOTH versions of Priscilla #2. (Did you know there were two versions?) Here’s the cover of the longer one. I’ve started going through and photographing all the patterns and pictures so that I can load them onto my Evernote account and be able to access them anytime I want (yay for being able to pull up any pattern on my phone!) and so I’ll have these pictures ready for posting here about the patterns I’m working on. Speaking of which, I don’t think I ever posted about the project I started with the King Tut. 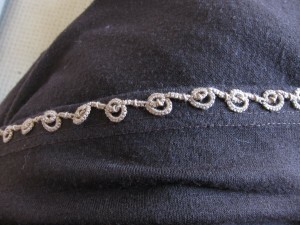 It’s on edging from Priscilla #2 that I made a while back out of an old size 10 thread. Here’s my start of it in King Tut Quilting thread with a Clover shuttle for comparison. I’m not really sure where I’m going with it or how long I want to end up making it. Right now I’m thinking that I’ll double it over as a bracelet. All I know is that unfortunately, the next step now is to unwind the bufflo horn shuttle and rewind the thread on to some nice new Clovers with undamaged points. 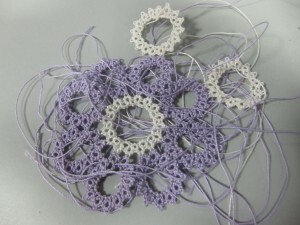 Yesterday I finished up with the circles of the 4th round of the tea cloth. It’s coming along quite nicely and I’m happy I got in some yellow so as to even it out. I thought I was about out of this yellow and all I had left was what was on the shuttle, but I just found another half a ball of it, and since I’m just about out of the orange now (have just two shuttles full left) I’m going to switch to the yellow for the rest of this center section of the tea cloth. It’s been a busy week, so no more progress on the on the “real” version, but I do think I’ve got the colors picked out for it. The rest of the week is going to be just as busy so maybe I’ll get it started this weekend. 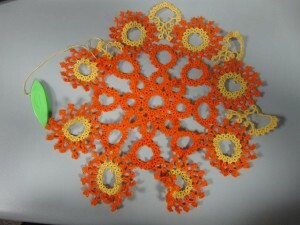 I did the tatting for this project while visiting the UK in August of 2009, the pattern is one I made up for the project. I had just a bit of this DMC brown left and I wanted to use it all up, but not end up short because part of the point of this project was to finish it off. I’m replacing my DMC size 20 with Lizbeth so I didn’t want to end up needing any more. If I remember right, I wanted a pattern that wouldn’t use too much thread, and would mostly use it from the ball so that I wouldn’t have to add more shuttle thread. This seemed to fit the bill nicely. I had plenty of thread left over for sewing it on the dress. In fact, I even had enough for two little flower motifs which I added afterwards. One thing that struck me while sewing it on is how nice it is that with the Lizbeth threads you can buy a size 80 thread to do your sewing that matches exactly with the size 10, 20, or 40 that you actually made the piece with. I’ve sold a couple copies of my fingerless glove pattern on Etsy lately. It’s a nice reminder that I need to finished updating the pattern for my other design and get it up there. Maybe that will be the WIP that I get finished this weekend.